Making waves for over 15 years now, SP:MC has cemented himself as one of the most respected & busiest MCs on the circuit. His first break came in 2001 after the legendary MC GQ heard one of his early mixtapes [with DJ Jubei] & made them residents at his own monthly Emcee Sessions event at Digwalls in Camden. SP has close ties with Shogun Audio [after touring extensively with Friction], & Exit Records after becoming dBridge's MC of choice. 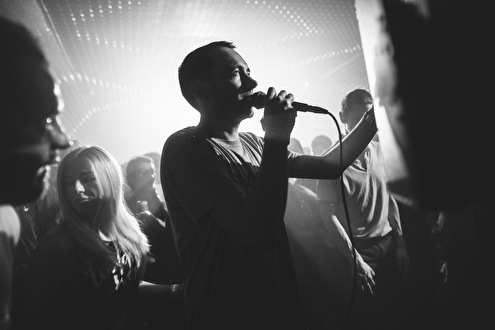 He has also hosted events for a wide array of imprints including Renegade Hardware, Commercial Suicide, Hospital, Prototype, Bassbin, Good Looking, Metalheadz, Valve, Quarantine, Digital Soundboy, Symmetry, Soul:R, Innerground, DNAudio, Critical, Rinse, Tempa, Tectonic, Hessle Audio & 3024. Versatility & quality control are guaranteed when SP's in the building. He cites MCs GQ, Dynamite & Conrad as early influences. In 2003 he was nominated for 'Best Breakthrough MC' at the Knowledge D&B Awards. He was then nominated for 'Best MC' at 1Xtra's XtraBass Awards in March 2007, & was shortlisted at the D&BArena Awards 2009-2016. In 2011, SP was crowned 'Best MC' at the D&BArena Awards. His music production has also received widespread acclaim. 'Shadow' with Breakage & 'Surrender' with fellow MC Ben Verse set the standard, then 'Trust Nobody', released on the infamous Tempa imprint in 2008 made a serious impression. The Code 3 [consisting of long time friends SP, Jubei & Dakuan] track 'Living Proof' released on Exit Records in 2010, is considered by many a modern classic. 2011 saw his vocals feature on Icicle's mighty 'Dreadnaught' released on Shogun Audio. Soon after, another huge 12" landed on Tempa in the form of 'Hunted' [with LX One] & 'Oh my Gosh'. His 4-track 'Declassified E.P' released in 2013 saw further experiments at 140bpm. In 2015 he released 'Kingsland Dub' another collaboration with LX One on his LP 'Motions' & 'We Run Dis' on the final Digital Soundboy LP.